Today I receive the sad news that a dear friend’s son has died from cancer. I’ve followed this journey through her eyes as she wrote every day. This morning, I read the big sister’s thoughts on losing her little brother. She calls this entry, “A Time to Dance,” and it’s so hard to read without crying–not just because she’s grieving, but because she’s also getting married in two days. I’m a writing teacher. I talk about writing all day long. All morning, I find myself marveling once again over those brave souls who take a pen to paper (or a finger to a keyboard) and dare to write because they must. Something happens when we write. It helps heal. It incarnates thought, and I’ll never get over the mystery of it. On the same day I read “A Time to Dance,” I read a father’s account of his daughter turning nine years old. This wonderful piece articulates something so beautiful that I can’t believe I’ve lived without these words. I wept for an entirely different reason (or maybe it’s the same reason). Death and celebration of life–in words–on the same day. I’m so thankful for brave writers. Has writing helped heal you? It wasn’t exactly an easy journey to school. With a two hour delay, I thought by 10:30 AM, the plows would have cleared the snow. With my daughters bundled in their seats, we barely make it down the street. My tires spin, and I’m fishtailing it up the hill. To make things worse, a construction crew handles traffic via two-way radios and hand-held stop signs to randomly tell drivers–who can hardly stop, much less start again–when to stop and go. My daughter grips her seat for dear life. It’s very quiet in the car as we look at the frozen hill ahead and all the cars around us. I’m really comforting myself. It’s true. We will make it. Some days just require a different kind of driving. You take what the day gives, and you manage it. Some days require both hands on the wheel. Some days you have the windows down and you’re flying. Some days, you barely make it. We might spin and fishtail the whole way and go when we’re supposed to stop and remain frozen when we’re supposed to go, but we will make it. It will take longer, and we’ll grab our seats in fear, but we’ll make it. Nobody said it would be easy. I want to remember that when life doesn’t present the smooth kind of road I’m hoping for. Praise God I’ve learned all kinds of ways to drive. Some days require a different way of living, don’t you think? Today, my students discuss suffering and loss in the context of Japanese haiku. Various writers suggest that we suffer so much because we’re so attached to certain outcomes. Releasing these expectations provides a coping mechanism that helps us enjoy life more. They’d already surrendered their lives. They’d already assumed they would die, and that made them endure. They moved ahead without fear. I think about this conversation all day long. I mull it over in my office and think of those soldiers on the walk across campus to my car. What must it feel like to surrender so deeply that anything that happens is a pure gift from heaven? What does it mean to receive what comes each day as a miracle because you expected nothing but death? I remember Galatians 2:20: “I have been crucified with Christ, and I no longer live but Christ lives in me. The life I live in the body I live by faith in the son of God who loved me and gave himself for me.” I’ve already died; anything that happens now is a pure gift and a pure miracle. Did this make any sense at all? I love teaching students who bring up such great ideas! This morning, we rejoice that it’s 30 degrees outside. We can’t believe our good fortune! 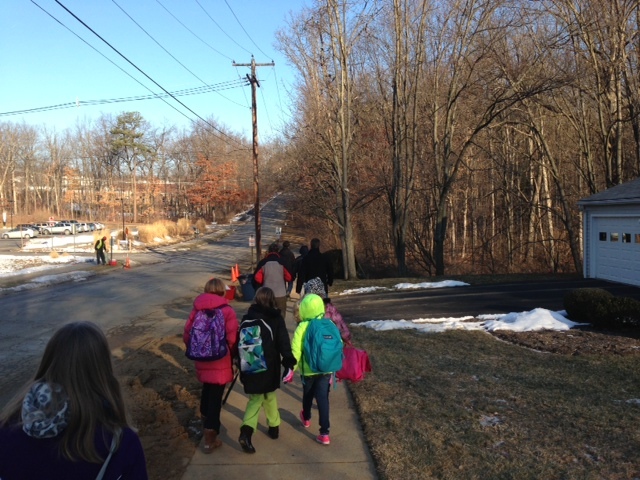 We can’t believe we can walk to school without going numb. Since it’s been 8 degrees in the morning for the last two weeks, this sudden change seems so wonderful. We simply cannot take this for granted. As I walk behind the crowd of dads and moms and eager children, I remember how much we all complained when it went from the 50’s to the 30’s. The very same temperature nearly devastated us. Then it was too cold! Then it was terrible and impossible! Today, however, after a new reality of really cold, we’ve lowered our standards. We’re thankful. We’re rejoicing. I begin to consider the ways in which God makes one truly thankful. Out of sickness, we rejoice in a single healthy day; out of joint pain, we celebrate a small moment of movement; out of depression, we dance over any sustained sense of happiness. Out of our lack, we receive blessing differently. We simply cannot take the smallest thing for granted. It’s like God has taught me to lower my standards so that the muckiest of days shows forth beauty. Maybe that’s the only way it happens: we’re lowered down into some dark, deep, frozen place because it’s the only way we’ll really recognize the bright warm light. Have you learned to be thankful for something you once took for granted? Today I encounter a familiar expression after asking a child to do something. I start explaining that most of the day, if you really think about it, surely involves what we don’t want to do. We have homework and packing lunches. We have making the beds, setting the table, and picking up toys. We have taking a bath, combing out hair, and brushing teeth. If we waited until we wanted to, nothing would ever happen. Wanting to is not the signal we’re waiting for. There’s something to be said for completing tasks and forgoing your feelings about it. Eventually, the emotions know they’re not in charge, and they behave. Did you complete your “I Don’t Want to Do This List”? I put this comment in the same category as criticism and complaint. It’s easy. It’s our default state to ignore beauty, goodness, and complexity. Anyone can say, “This is pointless.” It’s all pointless until we choose to dig into the matrix of a thing and uncover mystery and wonder and intricacy. That’s what I’m really doing as an instructor and blogger; I’m training myself and others to make a point. There’s something to notice here. There’s something so deep here that when you press into it, you might just find the Glorious. Maybe this is my simple defense of the humanities and the English major. It’s not pointless. Nothing is. What would you say to a student who looks at your assignment and says, “This is pointless”? As I clean my home today, I realize that whatever I set on the ground (blankets, coats, pillows, duvets), my cats assume it’s a place of rest. Even when I sit down, they assume my lap is a resting place. It’s funny that they actually believe I’m walking around for the express purpose of creating resting places for them. And they don’t discriminate; a bumpy backpack suits as well as a fluffy feathered duvet. Here’s another place to rest. And another. Oh, look, there’s another! 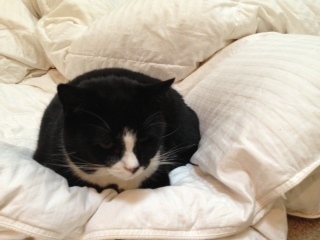 I look down at those cats who quickly, gladly, and indiscriminately receive places of rest. Whatever strange burden is flung across their path, their immediate response is to use that obstacle as a place of rest. If God is in the business of leading me to resting places, then might I see my own blocked path differently? This obstacle–this strange burden on the path–just might be my resting place if I let it–if I receive it as such. The sun comes out again after so many dreary days. At after-school pick up, the parents gather in front of the school to retrieve their children. The school doors open, and one little boy races–and I mean races–outside with his head fully tilted up towards that sun. A sea of parents and faculty part as he barrels on through them. He’s galloping now and casting off whatever hinders him: backpack, jacket, and even shoes were it not for the warning of his father to keep his clothing on. He’s off running to nowhere in particular. He’s enjoying the ever-so-slight variation in winter temperature and cloud covering; the sunshine means it’s a different kind of day. I love his response to even a little bit of warmth and light. He feels it fully and takes off anything that blocks that sun’s arrival on his wintered skin. Not even people stand in his way. I want to be that eager, that receptive. I want to gallop out the doors and let the sun shine on me. Do you remember leaving school on sunny days? It’s a slow day around here; I’m fighting a cold, and all I can think about is delicious chicken-n-rice soup. I cut up two chicken breasts and throw them in a pot of chicken broth with a bag of frozen mixed vegetables, lots of salt and pepper, some thyme, some cooked rice, and of course. . .
After an hour or so, I’m eating the most delicious soup, and I start thinking about that little bay leaf. What does it do, anyway? Why did my mom always put them in soups and sauces but remove them before anyone could accidentally eat them? I find a home economics site that answers all my questions about the poor, misunderstood bay leaf. To summarize, the bay leaf adds a subtle but absolutely necessary flavor. Without it, you definitely notice. The soups and stews fall flat. The roast doesn’t pop. The sauce doesn’t sing. Folks remove the bay leaf because it irritates the digestive tract if you eat it. I also learn this: You can fragrance a home with a lovely woodsy smell if you simmer water with bay leaves. You can also stick one inside a potato, bake it, and then enjoy a flavored baked potato. 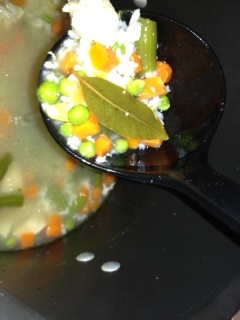 Check out the home economics site to get all sorts of recipes with bay leaves. So I think about that essential but subtle bay leaf (that’s also dangerous if consumed). It reminds me of essential things–although subtle–that hold a certain power. Prayer, for example, so very subtle and yet, it changes something. I love that little bay leaf. Do your recipes include bay leaves? Driving into campus today on the icy, snow-covered roads, I find myself skidding. What? Go faster? In the direction of the spin? Surely, you must be kidding. It’s true. The car rights itself this way. I accelerate and turn where the car skids, and I find I’m free of the danger. What if God wants me to move in the direction of my greatest fear–accelerating towards the very thing that frightens me–in order to right myself? I turn into the spin and pick up speed. I face it and find myself free. Have you ever moved into the direction of your fear and found yourself free?